It's not often that you see 50-year-old equipment in a modern physics laboratory, let alone find it at the center of cutting-edge research. But then, most such labs aren't run by Ronald Walsworth. A senior physicist at the Harvard-Smithsonian Center for Astrophysics and a member of the physics department faculty, Walsworth, along with postdoctoral fellows David Glenn and Dominik Bucher, developed a system that uses nitrogen-vacancy centers (atomic-scale impurities in diamonds) to read the nuclear magnetic resonance (NMR) signals produced by samples as small as a single cell. And they did it on a shoestring budget using an old, donated electromagnet. The system will enable researchers to peer into previously unseen biological processes as well as the chemical properties of materials, and could help open the door to answers to a host of new questions in fields ranging from condensed-matter physics to chemistry to neurobiology. The work is described in a paper recently published in Nature. "This gives us for the first time a tool for conducting NMR on samples that are similar to the volume of a single cell, while still maintaining high spectral resolution," Walsworth said. "There are two major challenges we address with this work. There's the spatial size, or the volume of the samples, and the other is the spectral resolution. To do useful NMR spectroscopy at these small scales, you need to have both." The difficulty in achieving both, Walsworth said, is partly related to the way NMR operates. Discovered at Harvard in the 1940s, NMR works by exciting the atoms in a sample by using powerful magnetic fields and measuring the radio frequencies they emit. Since each molecule emits specific frequencies, chemists and physicists have learned to read those radio spectra to learn everything from the material properties of various molecules to how proteins are folded. In conventional systems, those signals are measured using wire coils similar to radio antennas. 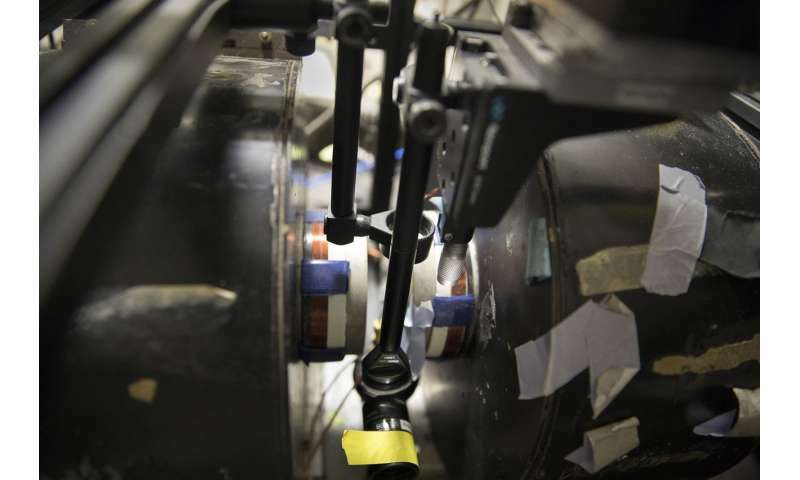 For smaller samples, however, the signals are simply too weak to detect, so researchers—including Walsworth and physics Professor Mikhail Lukin—more than a decade ago began to explore using nitrogen-vacancy (NV) centers to pick them up. "One of the very first ideas we had for NV centers was to use them for small-volume NMR, down to the level of single atoms or molecules," Walsworth said. "We had this vision 10 or 12 years ago, and it's taken many years to improve the technology to get to this point." 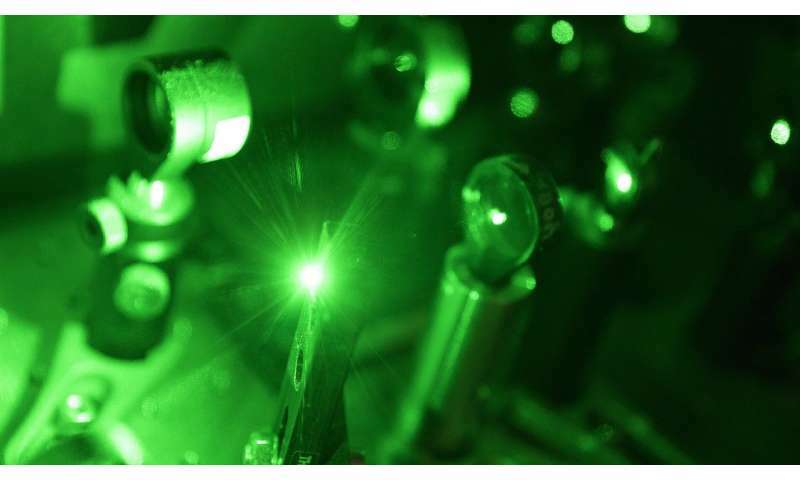 From their first nanoscale detection of an NMR signal in 2013, Walsworth said, Harvard scientists refined the NV technology, and in 2014 were able to detect a single proton. By 2016 they had used NV to capture the NMR signal produced by a single protein. Although they could detect signals from tiny samples, the NV centers were far from ideal. "When we detected single proteins, it was with NMR spectral peaks that were 10 kilohertz wide in frequency," Walsworth said. "But the separation between frequencies in NMR can be as small as a few hertz. So we were able to detect a protein, but all the chemical detail in the spectrum was washed out." Obtaining that detail from nanoscale samples, he said, remains a challenge because quantum mechanical fluctuations that would be unimportant in larger samples remain dominant at tiny scales, and molecules in solution diffuse away from the sensor, resulting in lower resolution. "So there are intrinsic problems with samples at the nanoscale, but you immediately solve those problems if you back up to the micron scale," Walsworth said. "That's still the scale of individual cells, which is much smaller than anything you can do with conventional NMR systems, and is still of great interest to chemists and biologists." Performing NV NMR experiments with micron-scale samples required a large magnet that was beyond the lab's budget. So Walsworth and colleagues were donated a 1965 electromagnet from Columbia University, which was arranged with the help of Roger Fu, assistant professor of Earth and planetary sciences. But that still left Walsworth and colleagues with the challenge of working around the resolution problems inherent in using NV centers. "One of those challenges is that the spins of the NV center, which are what do the detecting, only stay coherent for about a millisecond," he said. "Three years ago, we had an idea to get around that limit using a technique we call synchronized readout." Normally, Walsworth said, scientists would conduct a series of independent NMR measurements, then average them together to produce a final measurement. Walsworth and colleagues, however, developed a technique to take repeated measurements triggered by a clock that was synchronized to the NMR signal. By stringing those measurements together, they were able to measure signals with far higher resolution than before. The team then tested the system against three types of molecules—trimethyl phosphate, xylene, and ethyl formate—to show it was capable not only of detecting NMR signals, but of achieving spectral resolutions down to about one hertz, sufficient to observe key chemical signatures at the micron scale for the first time. 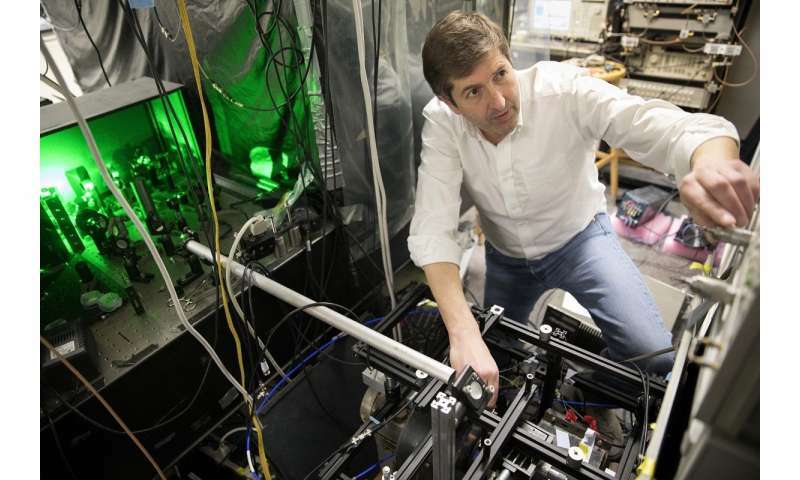 "We were able to show that the system works on these molecules, which were the simplest spectra we could find and still call them complex," Walsworth said. "This is exciting … We've solved a technical problem, but we still have more work to do before applying this to scientific problems." Going forward, Walsworth said he plans to continue exploring ways to boost the signal from micron-scale samples with a goal of making the system both faster—the tests described in the study took as long as 10 hours to obtain data—and more applicable to living samples. Researchers also need to focus on improving the sensitivity of the NV centers, he said, so they can detect faint signals produced samples in weak concentrations. "We need to increase the sensitivity by several orders of magnitude to do everything we want to do," he said. "Making these systems work on this tiny scale is a grand challenge now in the field."